It’s dark, cold, misty, and I’m standing outside of my house with a grocery delivery crate full of presents. I carefully weigh my options. My head instinctively looks to my right. The Dutch house we live in is similar to the brownstones of Boston or Brooklyn – tall, thin, and we share walls with our neighbors. “Well, I could ask him. Perhaps this will be the olive branch I’ve been looking for,” I think to myself. I’ve spoken to the right-side adjoining neighbor once. After months of listening to his fabulous piano playing through the walls, I tried to give him a compliment as he was entering his home. He has an alarm, parks his bike indoors, and ducks his head to avoid conversation. Everything about him implies introvert, but yet, I attempted determined conversation one sunny afternoon as we were both entering our homes. With his wild grey hair and thick glasses, he just looks like a concert pianist. He was trying to shove his bike into his foyer as quickly as he could. “Excuse me? You play piano, right?” He stared at me and his eyebrows furrowed. “Piano?” I repeat, and I make an air-piano motion with my fingers. He still just stares at me. “It’s very good, I enjoy hearing it through the wall.” He shakes his head, shoves his bike indoors, and shuts the door with a heavy thud. I instantly became paranoid. Babies crying all hours of the day and night and/or the agonizing responses to said crying by sleep-deprived mother might not be as melodic through the walls in response. Besides, for all I know, he’s the principal pianist of the Royal Concertgebouw Orchestra in Amsterdam and I just gave him an ignorant compliment. He could be. He’s that good. And I’m that clueless. I sigh and look the other direction. Two doors down is a girl whose mom is American and her Dad is Dutch. She’s nice, does not mind speaking English to me, and I watched her dog for her once. She was clearly desperate, as her dog just had surgery and she had an emergency meeting at work. She rang my doorbell, the kids were screaming, my two large dogs were barking, and her poor tiny dog had one of those lampshade things on her neck. With uncertainty on both sides of the exchange, she shuffled her dog inside my house while I, with Little Man on my hip, corralled my dogs upstairs. Baby Girl dizzily sprinted from the front door to the kitchen, ridiculously excited about our new furry visitor. Even my neighbor’s black cat had decided to join in on the party and wandered into the house as well, but after eyeing the conditions of her canine sister’s caretaker’s home, did not approve and scattered back out the front door. It was a zoo. The dog, probably scared out of her wits, peed on my rug and I put her in the backyard. Minutes later, I found the tiny dog had escaped both her lampshade and our backyard. I called V in a frenzy, “Our only friend on the street! She trusted me with her dog and now I’ve gone and lost the dog! !” I wailed. This was the height of the summer, with the limitless sunshine and equally limitless rain, everyone’s back gardens had turned into jungles – complete with tangled, thorny vines and swarms of spiders. The dog, with the help of the man three doors down, was spotted back her own yard and my husband, using a Swiffer duster as a sword, cutting through the spiderwebs, trespassing through back gardens, bravely rescued the poor little dog from her own yard, put the lampshade back on, and Baby Girl fed her treats as an apology and celebration in our kitchen. Hum. Maybe I could ask her. That whole event ended well, at least. She’s probably my best bet to help me with this project, and I started to walk towards her door. At that exact moment, the neighbor directly to our left opened his door. According to the American-Dutch neighbor, a family lives there. The parents live on the bottom floor, and their two grown boys live on the top floor. A common living area is in-between. I’m hoping it’s the Mom or Dad, but instead it’s one of the grown sons. I’ve seen him a handful of times, usually when I’m wearing whatever shoes are by the door (typically my husband’s) to throw a dirty diaper into the large trash bins outside. He is tall, with longish dark hair, and probably in his mid-20s. I saw him affectionately kiss his girlfriend goodbye one Sunday afternoon around 2:00 p.m. We had been to Home Depot (okay, Praxis – the Dutch equivalent) and I was planting flowers in our front garden. She leaned in, wet hair and all, gave him a kiss, then hopped on her bike and rode away. The bike-of-shame is infinitely more efficient than the walk-of-shame. I watched her go, stared at the closed door, and just reminisced about my youth for a minute while quotes from Old School distractedly flashed through my head, “Maybe Bed, Bath, & Beyond, I don’t know, I don’t know if we’ll have enough time. . .” Sigh. Youth. Anyway, so he’s walking out his door, ready to unlock his bike and speed off to whatever good-looking 25-year-olds do at 6:00 p.m. on Wednesday nights and I stop him. Here’s my chance! “Hi! Uh, I know we’ve never met, but I’m Celeste and I live next door, and so, I read somewhere that Sinterklaas is supposed to leave presents on the doorstep tonight, ring the doorbell, and then he just runs away. So. Uh. Will you take this crate of presents, wait about 30 seconds, ring our doorbell, and then just uh, run away?” I deliver the whole speech without taking a breath and smile brightly. He looks at me and laughs. But not really laughs. More like the laugh that sounds like air just coming out of your nose. “Sure,” he says. “Uh, okay! Thank you! !” I respond, a little too giddy. Smooth, real smooth. Perhaps Beethoven next door would have been more impressed with my American family’s noble attempt at partaking in their Dutch customs. Or perhaps I have this whole leaving-presents-on-the-doorstep-and-asking-a-neighbor-to-assist all wrong. (Dang you, Wikipedia!) Oh well, too late, now. I hand over the crate and hurry back inside. My kids are being so loud and rowdy, I realize I’m the only one who heard the doorbell ring, anyway. 6:00 pm, is the absolute worst time of the day to try and do anything productive with the kids. But I hear it, and excitedly say to Baby Girl, “I think Sinterklaas is here!” and we open the door. She’s so thrilled and we bring the presents into the living room to unwrap. Her attention is short-lived and I can’t help but think about why Santa Clause comes at night when the kids are asleep and then families open presents in the morning when the kids are happy. Compared to Sinterklaas, Santa Claus is a genius. That was Pakjesavond, (package evening), the evening of December 5th and the presents on the doorstep represent Sinterklaas’ final farewell. After delivering all the toys to the children of The Netherlands that night, he supposedly hops back onto his steamboat with his Zwarte Piets and returns to Spain. Spain? Steamboat? Zwarte Piets? Final Farewell? What the heck, you say? Okay – let me back up and explain, or at least try to. Baby Girl first met Sinterklaas at noon on November 24, the Saturday after (our) Thanksgiving. There were hundreds of children and parents gathered on the Beestmarkt (a part of Leiden where originally cattle were sold at market – so it’s one of the few largely open and paved spaces in town). The pavilion is not far from the train station and there are docks in the adjacent canal where tourist boat rides usually depart from. Dutch Sinterklaas songs played loudly through the speakers and there was a festive feel to the air, although as time went on, the moods of the children tipped rapidly towards unruly and frustrated as Sinterklaas’ hour-late arrival overlapped with most of the children’s lunch and naptimes. 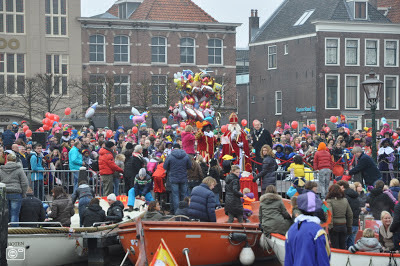 With happy hearts, we all celebrated the moment the bridge lifted and Sinterklaas’ boat arrived into the canal. 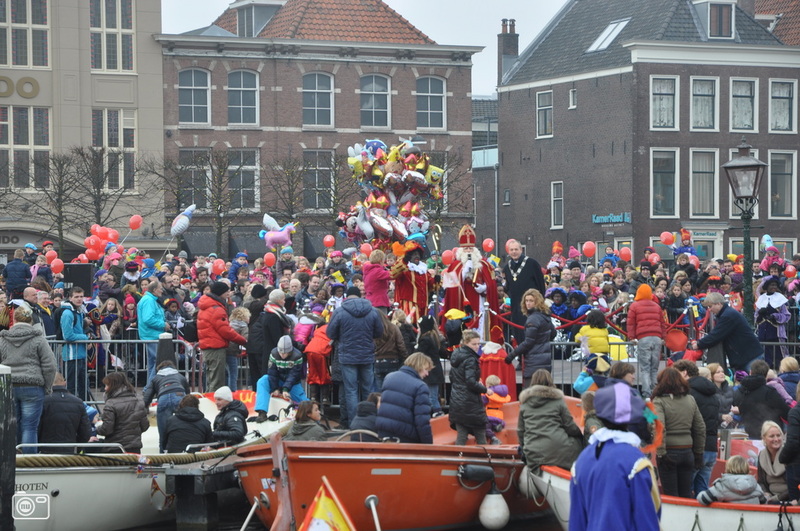 The children cheered and sang as the boat, which held Sinterklaas and his gaggle of Zwarte Piets, docked. They waved and danced and Sinterklaas exited the boat and mounted his white horse, Amerigo, who was awaiting him at the end of the dock. He wore a ceremonial bishop’s outfit complete with a red alb and mitre. From atop his horse, he nodded wisely and regally at the children, but definitely did not break into a smile, at least not one with teeth. I imagine a family reunion in the summer, and Sinterklaas shaking his head in annoyance at his overweight, cheery, loud American cousin who drinks way too much Coca-Cola. According to history, Sinterklaas is based on a Greek Bishop, Saint Nicholas, who was born in 271 and lived in Myra (present-day Turkey). In 1087, his relics were secretly moved to Bari, Italy, which was later conquered in 1442. It became part of the Kingdom of Aragon, which later became Spain until the 18th century. Because the remains of St. Nicholas were in Bari (then a Spanish city), the tradition is that Sinterklaas comes from Spain. The first known reference to Sinterklaas arriving in Holland on a steamship dates back to a children’s book written in 1850, by a schoolteacher named Jan Schenkman. The steamboat in 1850 was a new invention and perhaps Schenkman introduced the image while building upon the fact that St. Nicholas is also known at the patron of sailors. Santa Clause enlists helps from hard-working, serious elves who are so dedicated to their professions; they never seem to take a holiday to leave the North Pole. Sinterklaas, for all his stoicism, is assisted by the mischievous Zwarte Piets. The Zwarte Piets play in a marching band, constantly give boat-loads (literally) of cookies and candies to any and every child the encounter (at least before the American mother steps in with a panic – no more sugar, Piet! ), and they supposedly act as Sinterklaas’ spies to determine which children are naughty or nice. The few weeks after arriving in Leiden on the boat were like a never-ending celebration. Baby Girl made art projects at school and sang Dutch Sinterklaas songs. Supposedly, at anytime between Sinterklaas’ arrival and departure, kids can put their shoes by the fire in hopes of receiving small gifts. Sinterklaas took up residence in the Waag Huis (Weigh House) near the Stadhuis (Town Hall.) during this time. Baby Girl first visited him with her Dutch preschool, and then we attended an Expat-only event (marketed as Sinterklaas speaks English!) one Sunday morning. We all stood outside the Waag Huis freezing in the wind, as we waited (again) for Sinterklaas’ arrival. (I guess he’s on Spanish time?) It was a nice event and I’m glad we attended. The Zwarte Piets were quite friendly, handing out sugar to Baby Girl and even Little Man. Sinterklaas’ house and furnishings were a bit on the shabby and dated side. The carpets were dirty from all the crushed Kruidnoten (tiny cookies) from days prior. I recollected the perfectly built and expensively marketed winter wonderland scenes currently present in every American shopping mall. This was a far, far, far cry from any of that, but at the same time, spending a hundred dollars on pictures with Santa was not what this was about, either. Baby Girl chased Sinterklaas around the event – but when he turned to her, she kind of shied away. Throughout the event, she was pleased to give him high fives, but at the end of our visit, as we were almost out the door, she suddenly turned to V and I and said that she wanted to give Sinterklaas a hug goodbye, and she did. While tradition says that you can leave your shoes by the fireplace any evening between Sinterklaas’ arrival and his departure on Pakjesavond, we limited ourselves and only left the kids’ shoes out once, and left some water for his horse (Sorry, Amerigo - we didn’t have any carrots). The next morning, Baby Girl was excited to see the empty container after Amerigo drank it, and the Kruidnoten (still wrapped in the package, but then again, presents in shoes goes along with the Dutch disregard for those things germy. . .) left by Sinterklaas. Upon his departure, the whole country shifts its focus from Sinterklaas to Christmas. While I was afraid I was never going to be able to buy a real Christmas tree or candy canes after searching for these things in preparation for hosting my book club Christmas party on December 1st, I realized that I was just too early. After December 5th, Christmas tree (Kerstboom) vendors popped up around the foot of the De Valk windmill in town, random street corners, and even some grocery stores. The train station, previously decorated with white lights, added large glowing Christmas trees after December 5th. I actually enjoy this idea – of separating the children’s celebration of gifts and fun from the actual celebration of the religious and more family-oriented holiday. Plus it makes the Christmas season and celebration last all month long. With the snow falling and cold temperatures, it just puts everyone in a happy mood. Maybe I should bake some cookies for my neighbors. 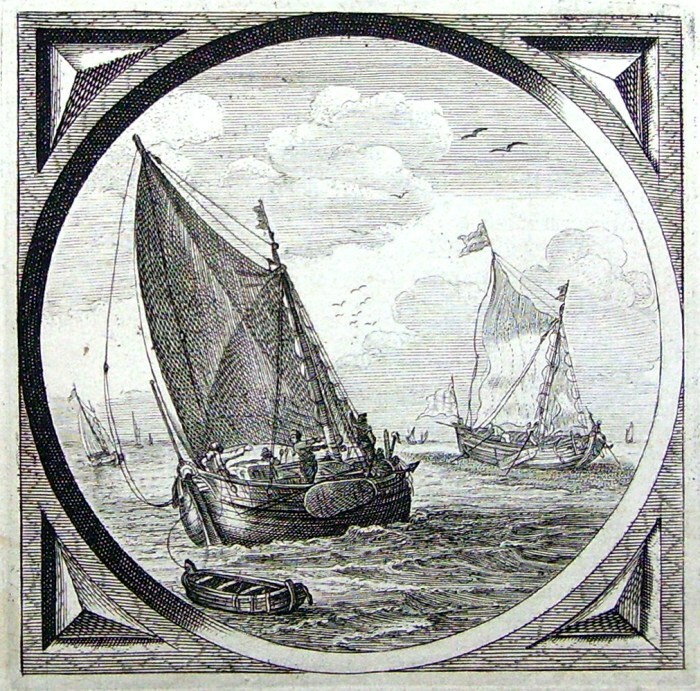 Boats like these sailed from Amsterdam to Leiden. 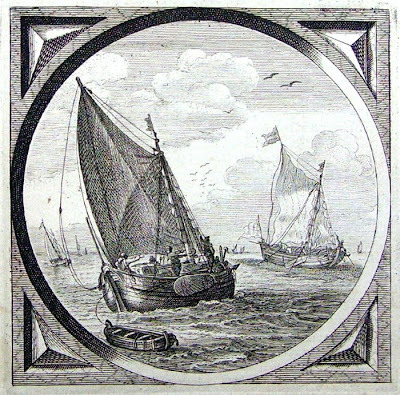 Engraving by A. van de Venne, ca. 1630. May 1, 1609 – I imagine a grey, dreary day but the trees are in bloom, their soft petals delicately showering the ground as the wind blows. The sun hides behind the clouds but teases to kiss the city below with its warm rays: a promise of happier times ahead. A large-sailed boat carrying poor but hopeful refugees arrives into Leiden. It had been a carefully orchestrated move, complete with permission granted by the city to allow the group of approximately 100 people to reside within its borders. In response to their application, the city of Leiden replied that it, “refuses no honest people free entry to come live in the city, as long as they behave honestly and obey all the laws and ordinances, and under those conditions the applicants' arrival here would be pleasing and welcome.” I imagine the lot as nervous, anxious, weary but yet, excited. They view the world around them with wide curious eyes, but yet they carry themselves with confidence and purpose. They maneuver their boat through the narrow canals and dock. They carefully exit the boat. At the time, about 1/3 of Leiden’s population were refugees, mostly from Belgium. Compared to the other thousands of refugees in town, their small group probably attracted little attention. But in response to the few passerby’s whom may have witnessed the disembarkment, I imagine the determined members of the group objectively holding their heads as they passed through the cobble stoned streets, giving away nothing of their feelings, amongst the inquisitive whispers in a language they did not understand. They have come to Leiden with hopes of peace and prosperity, because the town is famous for its industry and Calvinist University. 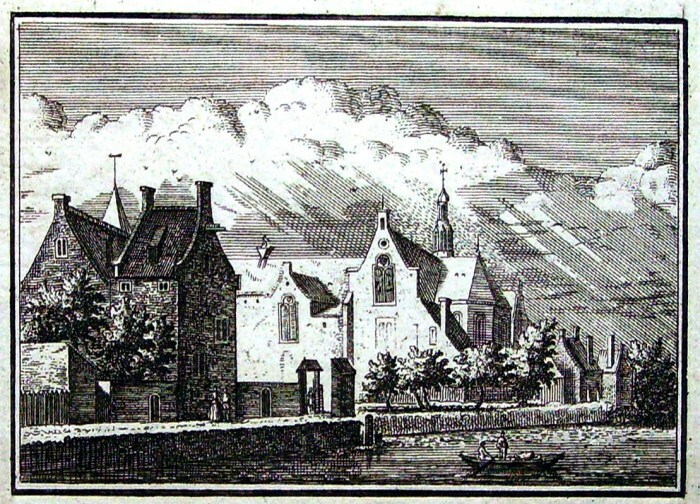 Delfshaven, where the Pilgrims embarked for New England in 1620. These men and women are Christians who separated from the Church of England, otherwise known as the Pilgrims. They had fled England to The Netherlands in 1608 and after spending a year in Amsterdam, a controversial split forced the group to divide from the Amsterdam Separatists. Leading the charge, John Robinson and William Brewster decided to move their remaining Separatists (about 1/3 of the original population) to Leiden. For 12 years, the congregation lived and worked in Leiden. Of the 100 members, about half of the Pilgrims worked in Leiden’s booming cloth industry. The textile industry lived and thrived with the immigrant population and in 1612 more than 95,000 large pieces of cloth were made and stamped with Leiden’s unprecedented seals of quality. Starting in 1620, the Pilgrims started to emigrate. They left to Delftshaven (a suburb of Rotterdam) via the Speedwell, which took them to Southhampton, U.K., where they met up with the Mayflower. The Speedwell turned out to be leaky and had to be sold; therefore, everyone climbed aboard the Mayflower to make the famous solo voyage across the ocean. The Pilgrims created the first English settlement in America, Plymouth Colony. One year after the Pilgrims left Holland they dined and gave appreciation for a plentiful crop alongside their Native American neighbors. This harvest feast of 1621 is commemorated annually in America on the fourth Thursday of November, Thanksgiving Day. The day after my family and I returned from America, my good friend from Germany, Amy and her roommate, Andrea arrived in Leiden. The plans were to celebrate Thanksgiving in Europe, no matter what. In anticipation of their arrival, I had excitedly and purposefully cleaned my house all day. That’s the thing about living in The Netherlands – I’m not sure if it’s my old home which isn’t properly sealed, the fact that there is no central air or heat, and/or because we do not live far from farmland (I always recall memories of my Grandmother complaining about trying to dust her home in Lubbock, Texas) but when we go on vacation, no matter how much I clean beforehand, I always come back to a dusty house, smelling like dirt. Which, by the way, is exactly what you want after you’ve traveled halfway across the world, or rather, not-so-much. Either way, I was motivated to clean and by the time my friends arrived on Wednesday evening, the house happily smelled more like flowers than potting soil. My friends have friends who have access to the American military grocery store outside of Frankfurt, Germany. They came armed with the most precious of plunder – French’s Fried Onions, Stovetop Stuffing, Jiffy Cornbread Mix, and canned pumpkin. To my excitement, I found cranberries (marketed as “De power-bessen uit de USA!”) and sweet potatoes at our local C1000 grocery store. Unfortunately, the only turkey I have ever seen in the country was walking around a petting zoo in Merenwijk, located within a bike ride (or extremely motivated stroller walk) not too far from our house, so I had already decided months ago, that the Barefoot Contessa's Lemon Chicken recipe was going to be our main dish of choice. (Side note: I did learn from a fellow mother that The Netherlands does have turkeys around Christmas time. You can find them at a special butcher, for a special price. After hearing the details, I think we will still just opt for chicken at Christmas again.) Who knew turkeys were so. . . American? We shopped at the grocery store the night before Thanksgiving with ease. Baby Girl went to school on Thanksgiving morning, and after a full day of work, V arrived home around 6:30 p.m. With that, it wasn’t quite the typical Thanksgiving Day off, but the new format had its advantages. Amy, Andrea, and I divided and conquered the menu, and while rotating who was in charge of entertaining the kids, we cooked the entire meal in just a couple of hours. We gave the kids a small sample of each dish and put them to bed by 7:00. After Skyping my brother in California and wishing other family members a happy holiday, the four of us sat down to a grown-up and uninterrupted meal around 8:00 that night. (Which was kind of appropriate, since my family always ate our Thanksgiving meal early in the afternoon – Central Standard Time). Leiden still celebrates the American-Dutch relationship and can proudly boast that no fewer than nine of the American Presidents, including recent Presidents, George Bush and Barack Obama, descended from the Leiden Pilgrims. Every year at 11:00 a.m. on Thanksgiving morning, a non-denominational Thanksgiving Service is held at the historic St. Pieterskerk in Leiden. The Leiden American Pilgrim Museum was founded in 1997 and illustrates the daily life of the Pilgrims while living in Leiden. The weekend was a successful and happy one. I enjoyed being able to mesh an American holiday with a life-long friend, on a new continent. We missed the Macy’s Day parade, but didn’t miss the Black Friday (or what is this. . . now Black Thursday afternoon?) specials. Amy and Andrea toured Amsterdam during the day, and we all feasted on leftovers and played card games at night when they returned. As any fabulously creative elementary school teachers would do – they took my imported American Christmas decorations and helped me find the perfect method of decorating my Dutch home with them, all of which occurred, the day after Thanksgiving! The Dutch are apparently pressured to not decorate their homes for Christmas until after Sinterklaas on December 5th. . . A rule we broke, of course, without knowing (like so many others), so in the end, with our fake Christmas tree already up before beginning of December, we had a jump-start on everyone else. 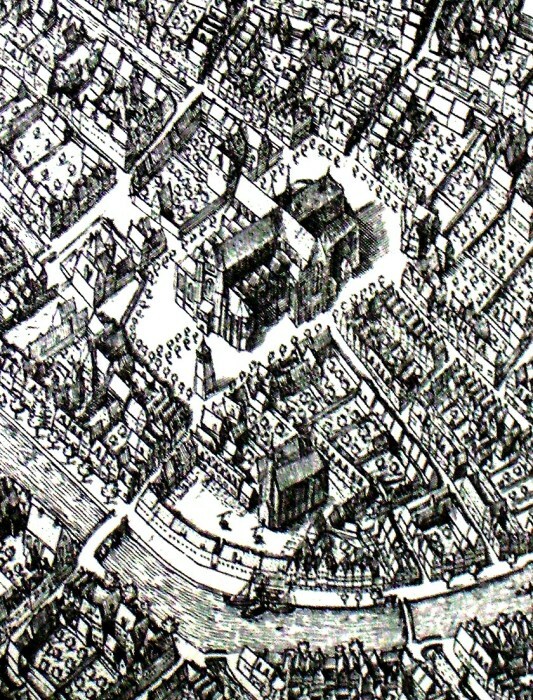 Map of Leiden (detail) showing the Pieterskerk. free-standing bell tower. 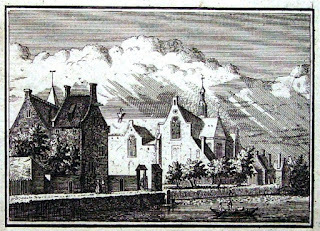 Engraving by Pieter Bast, 1600. A few hours before their train was scheduled to depart we even attempted a family photo-shoot in hopes of obtaining a Christmas-card-worthy-photo (nevermind the logistics of such things. . . there’s always email, right?). Amy, an amateur photographer, in a desperate attempt to turn the darkest room of our house into a successful photo, turned on all lights, brought in lamps from the other rooms, opened curtains, and then setup the family in front of our Christmas tree for the event. We all dressed up, but unfortunately, Mama’s excessive primping routine overlapped into Little Man’s morning nap time and while we did attempt to take what seemed to be about 500 photos, I can’t say there is a single one where both kids are smiling. (This is the fact of life, right? My mom always shook her head wisely. . . the more children and more dogs you try to take photos of. . . .) Oh well, the memories of my Thanksgiving ‘family’ making ridiculously goofy faces in attempts to entertain my children resulting in only making me and V laugh in spite of ourselves is priceless. They rushed out the door and we said brief but meaningful goodbyes. Behind them, they left a multitude of happy memories and a precious box of Jiffy cornbread mix in my pantry. There is little doubt in my mind that the Pilgrims may have learned a thing or two during their stay in Leiden, which perhaps influenced their thinking when creating the ideals and traditions of a new land and the Mayflower Compact. One theory I ran across in my research is that perhaps the Pilgrim’s idea of having a specific day dedicated to thanksgiving was influenced by Leiden’s Onzet – the October 3rdcelebration of the Relief of Leiden from the Spanish, which of course, they witnessed if not celebrated alongside their neighbors, for at least 12 years. Like the Pilgrims, I am thankful for the perspective life has given me, the friends and family I have, the beliefs I hold true to my heart, and to be able to celebrate it all, no matter where I am.